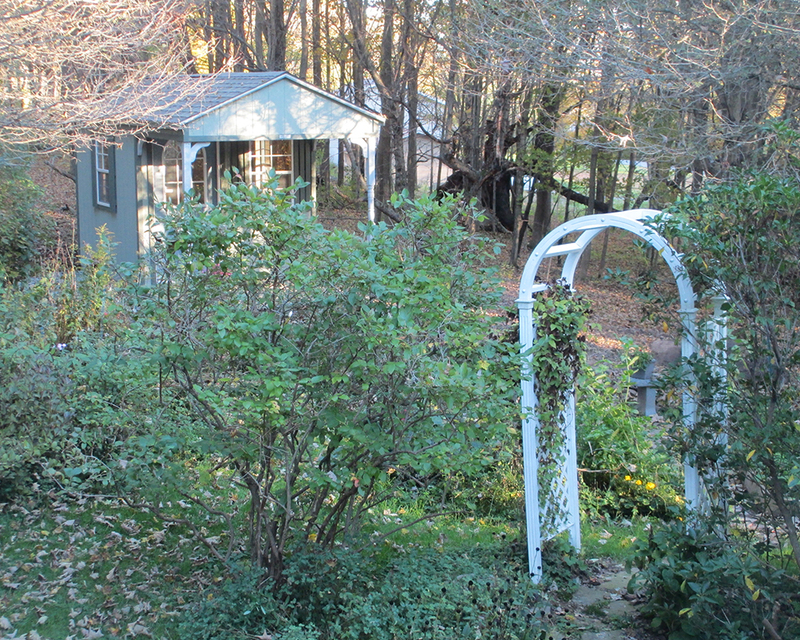 Add a porch. Porches help give a shed the look of a home. 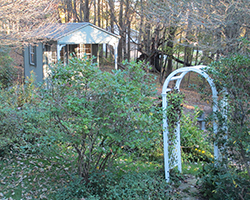 They also provide an outdoor area to gather and enjoy nature together as a family. 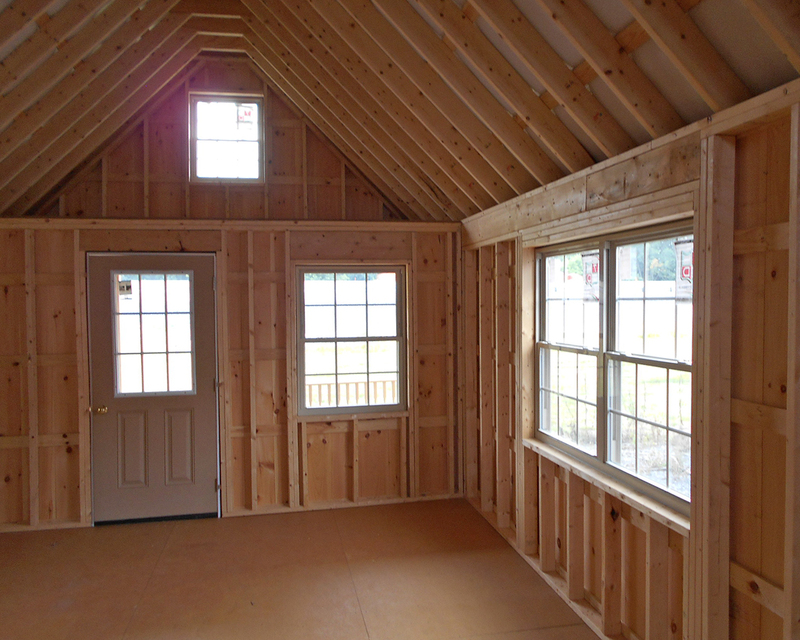 By adding a porch, you can also create a loft area inside for extra storage or sleeping space. 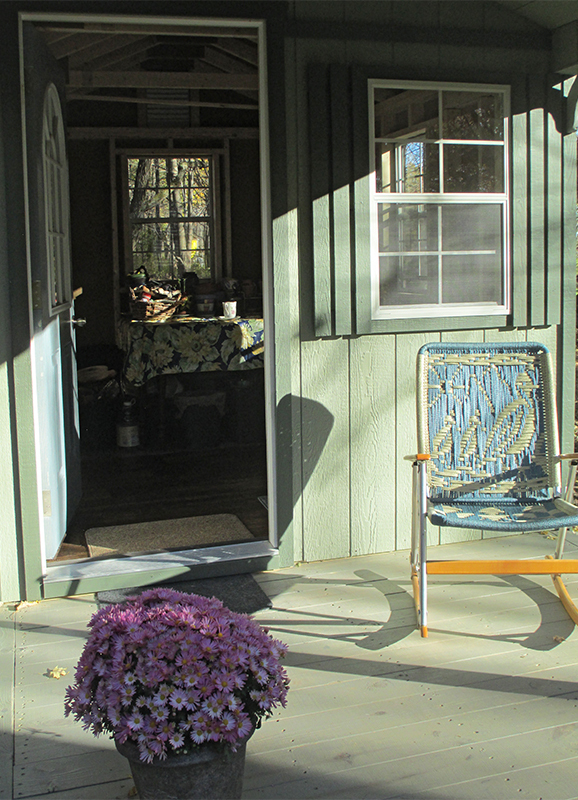 Porches are available with or without railing. Upgrade from a standard shed door to a house door. 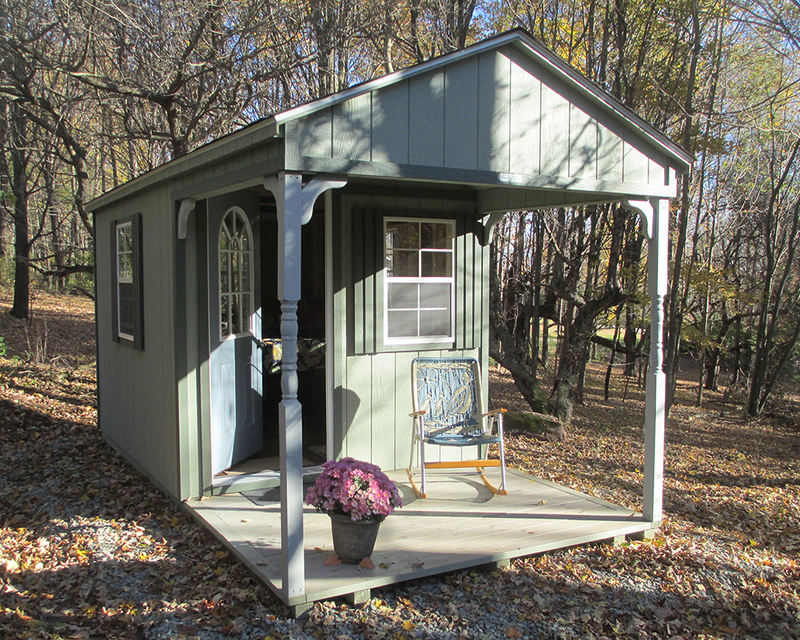 This really helps turn a shed into a cabin! Fiberglass house doors with windows allow extra natural light inside and let you see who's outside when you hear a knock on the door. 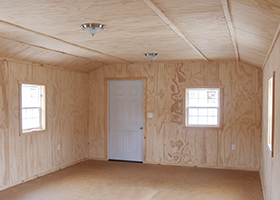 House doors also include a standard door knob (instead of a t-handle on shed doors). You can also add a deadbolt for added security if desired. You can choose if you want the door to swing out or in and whether the hinges are on the left or right. Add venting. This is an important upgrade we recommend for every cabin! Venting allows your building to breathe and air to circulate. A ridge vent and gable end vents allow warm, humid air to leave your cabin. Vented eaves provide an source of fresh, cooler air to help push warm humid air out ridge and gable vents. 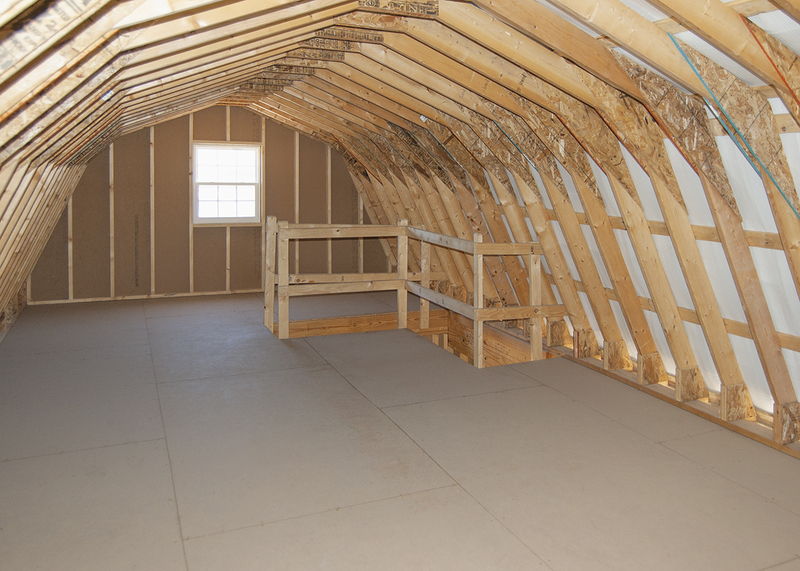 Without proper ventilation, your building will sweat trying to get the moisture out of the air. Insulate the floor, walls, and/or roof and choose insulated window and doors. 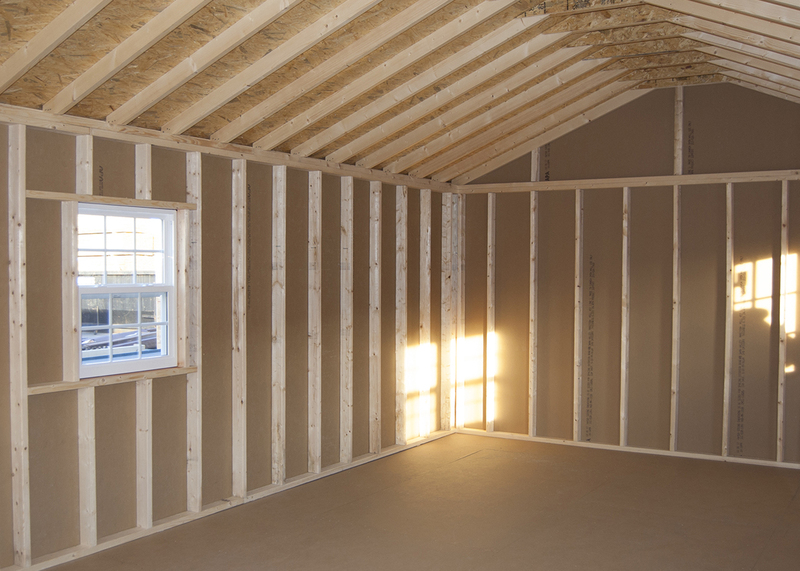 Insulation will help keep the warm air from your heater inside and prevent the cold air from outside from sneaking in during the fall and winter. 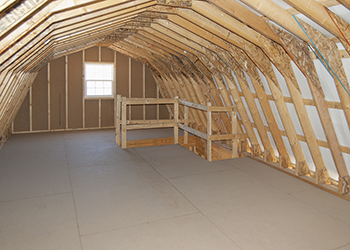 Various kinds of insulation options are available for the flooring, walls, and roofing. 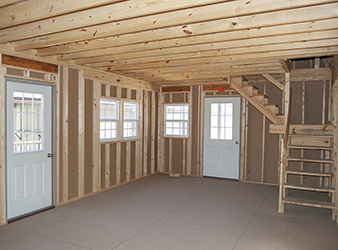 Insulated doors and windows are available in a variety of style and sizes. Raise the wall height. 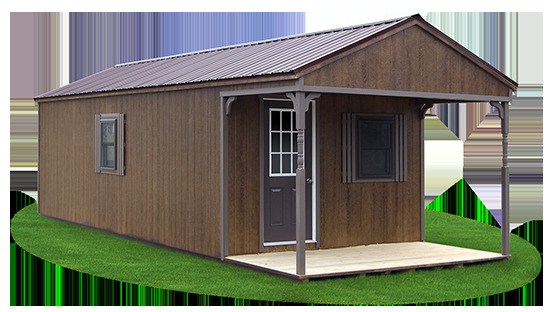 Depending on the size and style of the base shed you are customizing into a cabin, you may want to increase the wall height. This may be simply for comfort or it may be necessary for the other upgrades you choose. Add extra doors and windows. 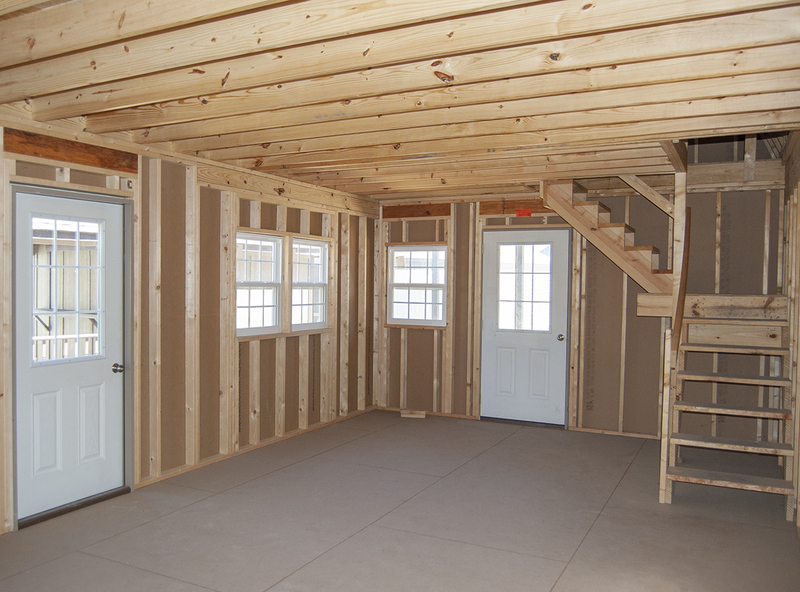 Depending on the size of the cabin you are designing, you may desire multiple entrances and exits. You may also want additional windows for added natural light and to let in a cool breeze on a warm day. They can be placed almost any way you desire! Ask about electrical packages. 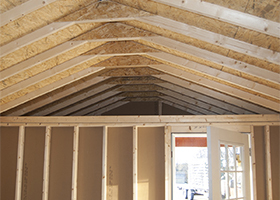 Some DIY-ers are great at finishing the interior themselves, but need help with the electrical components. We have a variety of electrical packages available including lights, light switches, and receptacles. Components can each be placed inside the cabin as you desire. Before placing your order: Make sure to check any regulations and codes set by your state, county, or township. 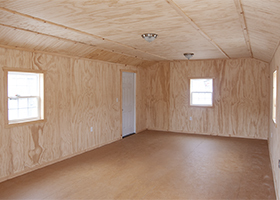 Once your cabin is in production, changes can be costly and delay delivery. Make sure to communicate any state, county, or township requirements when designing your cabin with your local store manager. We are not responsible for making sure that your cabin meets your local regulations ourselves, but will gladly help you design a cabin that meets the requirements you inform us of. 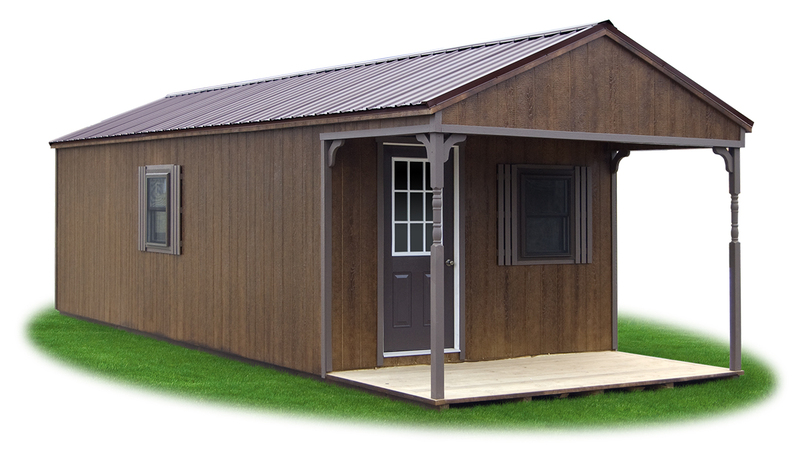 Like our sheds, cabins are generally delivered fully assembled to your site. 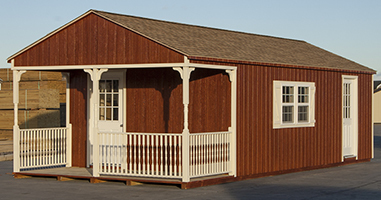 If your cabin cannot be delivered fully assembled or your needs are larger than we can transport, we can also build at your location to your specifications. 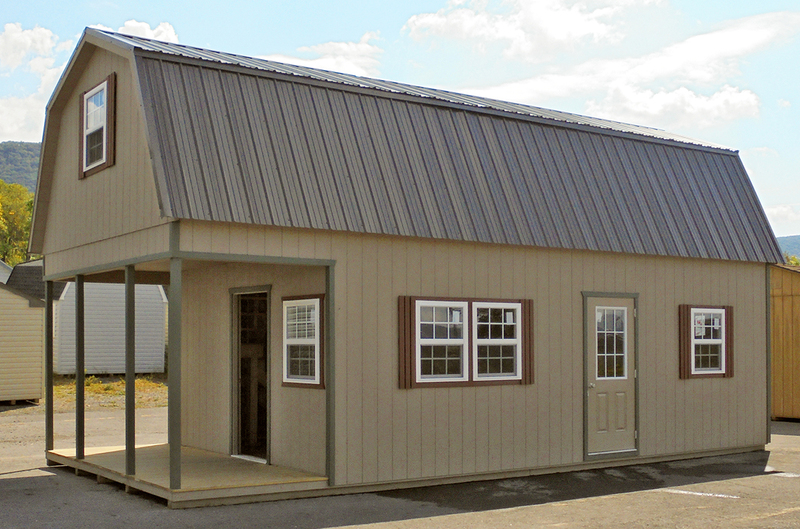 Please note: Our Rent-To-Own program is not available on buildings you intend to live in, including cabins. No exceptions. 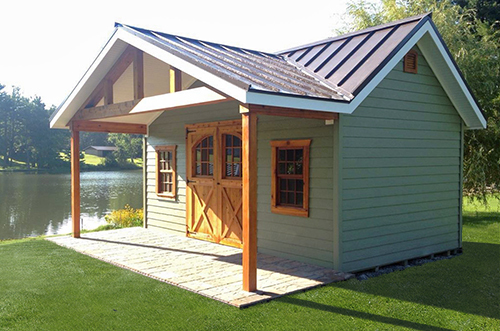 Colors: Coffee Brown polyurethane on LP smart side, Bronze trim and shutters, Brown door, and Dark Brown metal roof. 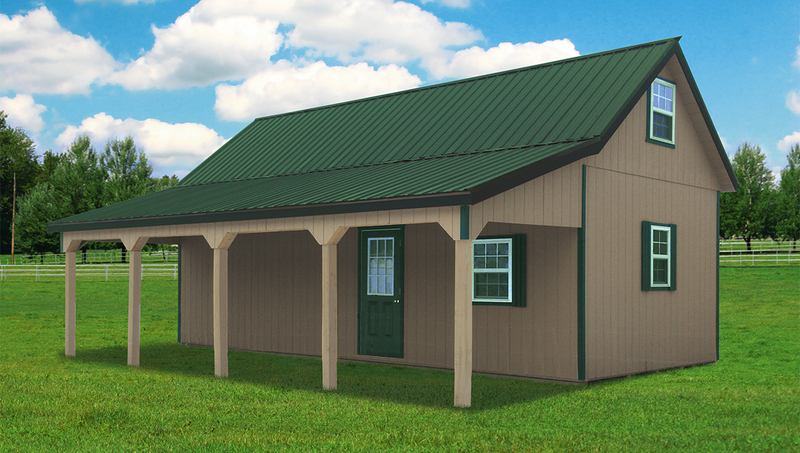 Customizations Shown On This Cabin: 6' porch, additional insulated windows, 9-lite house door (with in swing), upgrade to 2x6 floor joists, insulated floor (R-19), upgrade to metal roof, full ridge vent, and full eave vents. 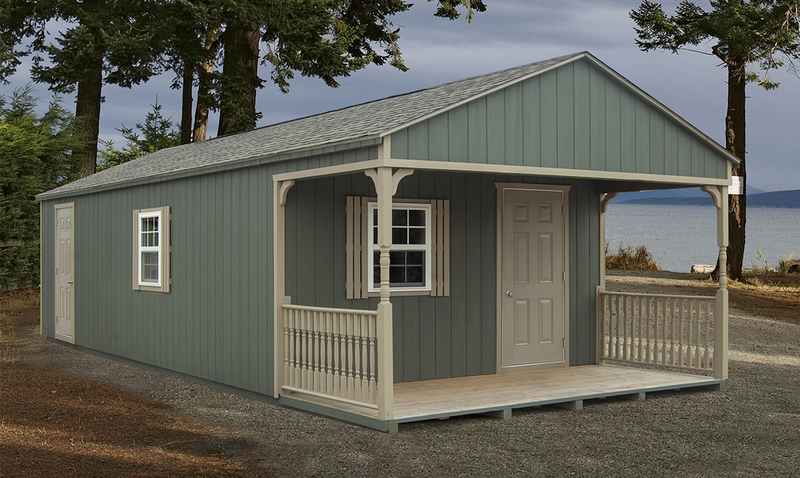 Customizations Shown On This Cabin: Raised wall height, 6' porch with cathedral ceiling, additional windows, 11-lite house door (with in swing), upgraded trim, ridge vent, and end vents. Customizations Shown On This Cabin: 6' porch with railing, additional windows, 9-lite house door (with in swing), 8" overhangs on all sides, 12/12 roof pitch with 2x6 rafters, metal roof with full ridge vent, insulated floor (2" blueboard) with vapor barrier, and wall framing inside. Delivery & Setup: The bottom half of this will be delivered assembled and set in place. Then the top half will then be assembled on site. Normal assembly time is about 5-7 hours. Customizations Shown On This Cabin: 6' porch with railing on sides, additional insulated windows, two solid house doors (with out swing), 20' shingle over ridge vent, felt paper under shingles, floor insulation (double bubble and R-11), insulated walls (R-11), insulated ceiling and loft area (R-19). Interior finished with electrical package (lights, receptacles, etc) and beadboard on walls and ceiling. Customizations Shown On This Cabin: Additional insulated windows, sliding patio door (with grids), upgrade to 2x6 floor joists, insulated floor (double bubble), two 2' roof dormers, 8' roof dormer with 24"x27" window, full ridge vent, and full eave vents. Colors: Redwood polyurethane on LP smart side, Navajo White trim and shutters, White door, and Shakewood shingles. 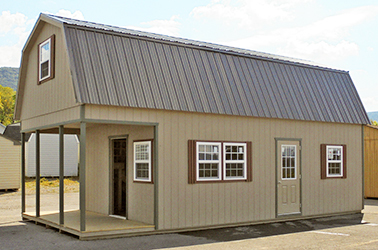 Delivery & Setup: This structure is delivered fully constructed. 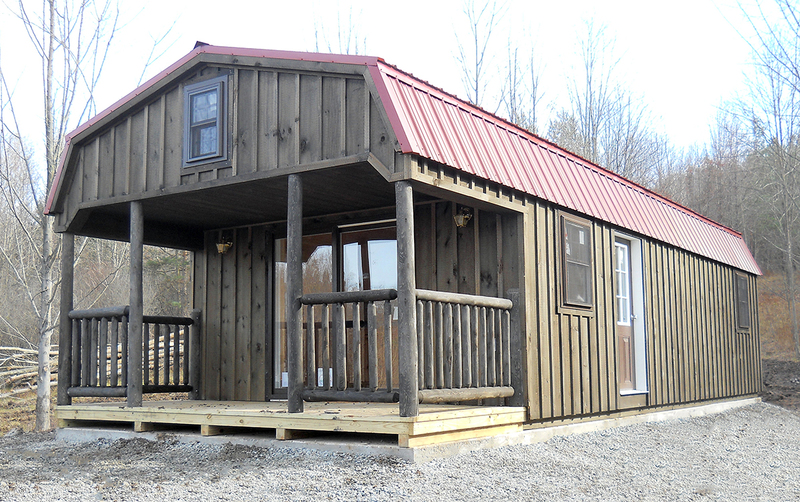 Customizations Shown On This Cabin: 6' porch with rustic log railing, additional insulated windows, sliding patio door, light fixtures mounted in porch area, 9-lite house door (with in swing), upgrade to metal roof, and full ridge vent. 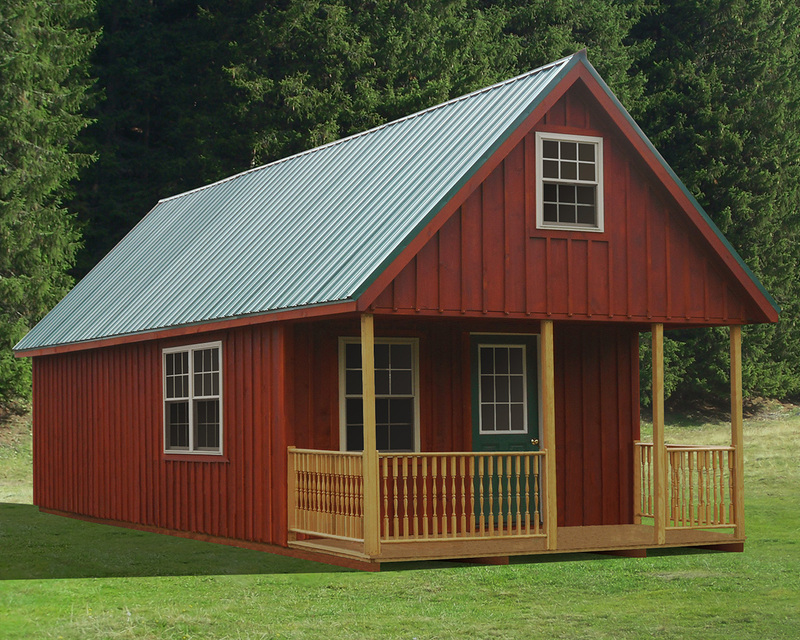 Customizations Shown On This Cabin: 6' porch, additional insulated windows, two 9-lite house doors (one in swing and one out swing), 3" corner trim, taller rafters, roof insulation (double bubble), full ridge vent, vented eaves, floor insulation (double bubble). 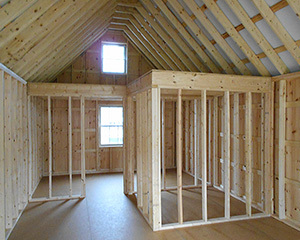 Delivery & Setup: The bottom floor of this will be delivered assembled and set in place. Then the top floor will then be assembled on site. Normal assembly time is about 5-7 hours. 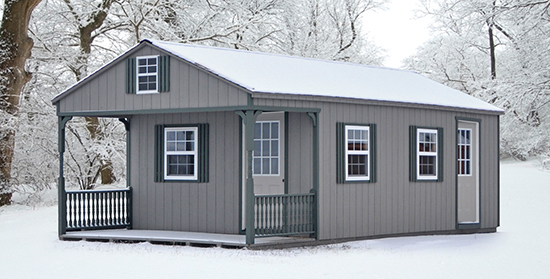 Customizations Shown On This Cabin: 8' custom porch, additional insulated windows, two 9-lite house doors (with in swing), vented eaves, and floor insulation (bubble wrap). Delivery & Setup: The bottom floor of this will be delivered assembled and set in place. Then the top floor and porch will then be assembled on site. Normal assembly time is about 5-7 hours. 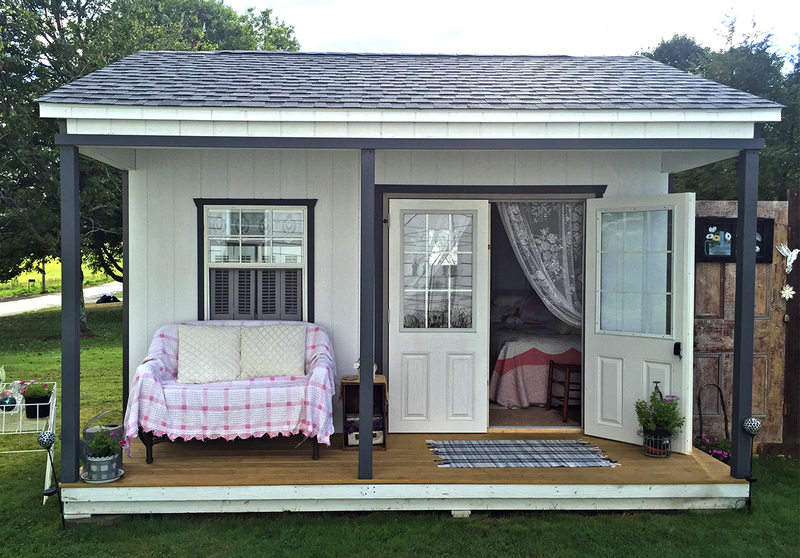 Customizations Shown On This Cabin: 6' porch with railing on sides, additional insulated windows, two 9-lite house doors (with in swing), full ridge vent, and full eave vents. Customizations Shown On This Cabin: Custom color match on siding, upgrade to cedar carriage house doors, wood windows with cedar trim, wall height raised to 8' 6", standing seam metal roof, full ridge vent, 2x6 pine rafters, 12" roof overhangs with azek beadboard soffit, azek fascia trim and corners, custom 22' front dormer (with azek beadboard cathedral ceiling and wrapped LVL) to create 7' porch (with wrapped posts), archtop gable end vents, and diamond tread plate. When requesting a quote, please be a detailed as possible with the features you're looking to include. If you're just looking for a ballpark figure, let us know so we can accommodate your request faster. 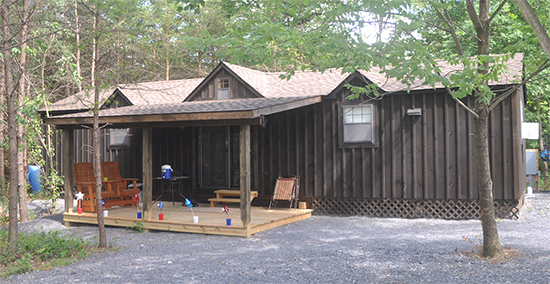 Our cabins can vary greatly in price, depending on what features you choose. Size, style, and additional options all go into determining a price. Please note: Our Rent-To-Own program is not available on buildings you intend to live in, including cabins. No exceptions.